Captain Dennis Wallace-- universally known as “Brazakka,” an Aboriginal term for “wild man"-- is one of the world’s great black marlin captains and a tireless promoter of Australian sport fishing. At 15 Wallace began working trawlers off the New South Wales coast. Three years later he had enough sea time to earn his master's ticket and become one of the youngest skippers on Australia’s eastern coast. 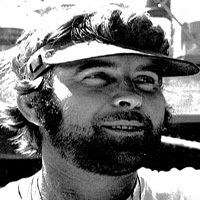 In 1968, as game fishing began to take hold in Cairns, Wallace set up shop there, purchasing George Bransford’s Sea Baby to become the third charter operator in the local fleet. But in 1970, he began leasing private boats for the season and weighed 18 granders by 1975. Wallace designed the 54’ Sea Venture-- the first self-contained, live-aboard game fishing boat-- and it stayed booked all year with clients from around the world. The colorful and quotable captain was featured in beer commercials; the movie Brazakka’s Reef starring Lee Marvin; and the Australian version of CBS' 60 Minutes. President Jimmy Carter and poultry magnate Don Tyson --IGFA Hall of Famer and Trustee Emeritus--were clients. But Marvin was one of Wallace's best customers. After meeting in a Kona, Hawaii bar in 1973, Marvin fished 12 seasons with Wallace, weighing 13 granders-- including a 1,320-pounder. They tagged at least a dozen more. Wallace also took anglers helicopter fishing for barramundi.